Similar to audacity, not quite as many features. Does have easy tempo change, reversal of bad words, fade out, and more basics! Also LOVE the fact that you can text your final edits and not just email! This app is still my favorite. So far still works. But there's one bug that's been happening a little more frequently. When I play a track (usually after some editing. To be specific: pitch and speed) it randomly stops playing it in the middle. I can always still play it, but it just randomly pauses. Still a good app. Hasn't failed me yet. TwistedWave makes recording simple. It's intuitive and for recording of audio book format, it is as simple as 1,2,3. The only "problem" with it is... I don't get to spend as much time on it as I would like. It is just not my kind of editor other people will love it though. I think it is priced way too high for the low quality of the app. I began using iPhones the first day the iPhone 1 became available in the United States. Just for the record, that was June 29, 2007 or almost ten years ago. Over the years I've used various audio enhancers, FLAC Players, audio converters, extreme high-end headphones, earbuds ... you name it, I've tried it all in an effort to get the best sound I possibly could out of my little iDevices over these past 10 years. Then quite unintentionally, I discovered this app on sale (actually it was free for 24 hours or so) and once I opened it up to see what I could do, I discovered I could do wonderful things to my existing audio on my device or any music I care to put on it later. If you want to amplify your music so that it's crazy loud? Just run it through this App ... it's got adjustable decibel amplification, so get ready to bang your head!! Just turn it up 3 to 5 dB to start and find out where you're happy - don't be crazy and amplify it until your ears blow off your head. There's a very well written review somewhere amongst all these others titled 'Mastering for iOS'. It was written by a man named JohnK916. And John and I are kind of walking the same path, it was a little bit weird reading his review because we both have been going through our music libraries and basically remastering them. I hope he's enjoying his tunes as much as I am enjoying mine! 🤘🏼😎🤘🏼 Highest Recommendation!! Best audio editing app on iOS. Don't need my laptop with this app around. This app does not work with the Shure Mv88 stereo microphone for ios. I just lost an entire classical piano concert because the app is not stable and just decided to disconnect from the microphone in the middle of the concert even though I had do not sleep turned on and had airplane mode and do not disturb turned on in my iPhone. I also had all notifications turned off. After The mic was disconnected by the app it continued to record an hour of silence! I never have any problems with any of my other recording apps.. I contacted the developer and not even he knew how to solve this problem. This app is a waste of money and money down the drain and a important concert lost. I want my money back. Original Review: Great! This is a full featured professional voice recorder and editor - and is more fun to use than Audition. (The editor is far better - and faster - than Garage Band. Think Audition.) I use this app to record audio books and edit on this app. I bring it into Audition to master. :) Update: 2 years later: This incredible app still provides a terrific experience and is one of the app-store's very best. I sincerely thank the developer for this. I use it for the recording and editing of professional audio books. I still take it into Audition for noise reduction and mastering. I love this app. Thank you. I use for recording interviews... On my IPhone 6 I was able to adjust the gain input as it records super HOT. I upgraded to an iPhone 6S Plus and the option to adjust the gain is no longer available. Unreal. How can upgrading lead to less features. Best and only audio app you should own! I want my money back!!!!!!! Great app, lots of good features. I've successfully used it to edit some pretty large files. The only problem is that there is no multitrack feature. Come on guys, we really need that feature in order for this to be a complete audio recording and editing app, especially with a $10 price tag. I'll rate this 5 stars when they add this feature. Until then, it's great for simple editing. Hi. I'm having trouble copying and pasting. Because when I paste things, it doesn't paste correctly (coming out with no wave of audio) and then the app either freezes or crashes. Can u plz update it so that you can fix it please. It's starting to get annoying. Been looking for an easy to use audio editor since GarageBand can't handle longer podcast lengths. I haven't spent a lot of time with this app yet, but I plan to! Very easy to use and cut audio. Lots of options for tweaking small aspects of your sound that a lot of other apps don't have (or aren't intuitive to use). I recommend it! This is a great app for quick music editing/cutting. It's accessibility between devices is great...just send a text. Its simple to use and quick. It is limited...cannot drag ends of edits, cross fade isn't an option, cannot overlap tracks, fade in/out is limited. Works well for fast simple cuts. This is a great app! It's very easy to edit songs from iTunes using this app! Just email yourself the song and choose open in TwistedWave. Joshua D said it better than I could. Great app! I have both versions on my phone to give me the option to playback previously recorded TW material along with other apps while I'm recording the whole thing with the other TW version. Having used Audacity on my PC for years, I needed an equivalent audio recording and editing app when I switched to iPad as my portable production studio. TwistedWave is excellent; everything I need. I was doubtful that a touch interface would suffice for audio editing, but I was wrong. It is very intuitive with a low learning curve, and it comes with all the standard filters and adjustments I need to clean up my voice recordings. The only thing some would complain about is lack of multi-track recording or ability to drop markers or notes on the timeline, but I've not needed those. I like all the export options and native Dropbox integration, too. I put this app in my "well worth the money" category. Thanks! Had a terrible misadventure attempting to use the highly-touted Ferrite app on this iPad Pro; paid the 20 bucks to unlock the "advanced" (poorly labeled) features - only to find a convoluted mess of an incomprehensible UI that an old Analog Audio Production guy like myself can't even begin to make use of without months of dedicated training. Despite my attempts to get a refund for that clearly mistaken purchase, I'm just getting "Radio Silence" from Apple. Guess it'll have to be a tax write-off as a minor bad business investment... THIS is IT! As Steve would say: "You already know how to use it." Right out of the box, I was importing, editing and processing tracks to my heart's delight in mere seconds. YESSS! You folks really need to better promote how beautifully clean and simple this app is - "I am over the moon" with its thoughtful design and, for me, flawless functionality and performance. Note to all VO professionals: Just get Twisted Wave, and skip the rest. Might as well use Garage Band, if you want to tinker around with complicated multitrack Music Production, or iMovie for audio/video work - I see no advantage to any of the other "Audio Editor" apps I've checked out so far, but as an old reel-to-reel tape editor/production veteran, what do I know? Now I can finally get back to work, happily. Thanks! The app's interface exceeds the dimensions of the iPhone 7 plus. I bought this yesterday to shorten/lengthen music tracks for my dance classes. In less than an hour and a half, I edited eight tracks using my ipad. This is simple to figure without instructions, though I only used copy/cut and paste options. I'm very pleased with my purchase. I can now pitch shift and make things sound like opera! LOL! By copy/pasting. It is possible to copy and paste audio between TwistedWave and other applications. In editing mode, tap the AudioCopy icon, in the lower right hand corner, and select "AudioPaste". 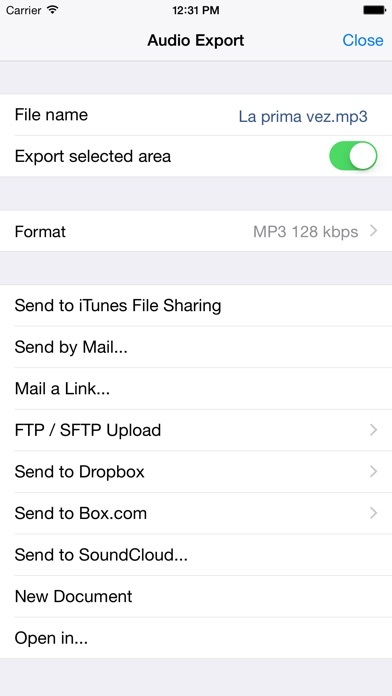 There, you will be able to select an audio clip that was copied from another application. Above is from the in app Help. In edit mode there are no icons (except for the "+" in the bottom left, which is inaccessible while edit is open understandably.) There's no excuse for those "basic" oversights. I use twisted wave on my MBA to record my podcast files. The IOS app is just like the big brother. It is clean, fast and has effects and export options that are second to none. Very good, excellent landscape (thank you, thank you thank you) mode. If you want to record or mess around with audio on IOS, get this. I don't know when Inter App Audio was added, but the best audio editor in the App Store just got better!! I purchased this app mainly for two purposes....to make pitch adjustments to my vocals after they are recorded, and to be able to stretch and/or shrink the length of any type of note that I have recorded as an audio wave in my multitrack recordings. This App is incredible. It allows me to do all of the above plus much, much more. Coupled with AudioCopy (included) and AudioShare, I can import single tracks of audio from my multitrack recordings in progress, tweak them to my heart's content, then export them right back into my on-going projects. I have been searching for such an app for months ...and here it is, exactly what I needed. Outstanding!! Dr. K.
Really useful app and very reliable. Definitely like the fact that it can record in 24bit/96khz... The th UI is easy to use and import / export options are very full featured as well. I use it as a two track recorder most of the time. This recorder and editor has everything! I've spent a good deal of time trying to find an app that would let me adjust the input level for a recording (don't want "auto gain" for music). This app will let me adjust every aspect of the recording and edit it too! The interface is a bit dated, but honestly, as someone who records gigs and lessons all the time with my phone, I am thrilled to have found this. I was under the impression that I could feed audio direct via usb/lighting but no it only will record with ipads mic. Best audio editor I found. I launched the app and pressed record--what a gorgeous interface! So far editing, recording, file management--all first rate. Sound quality is top-notch! I tried both the built-in microphone on my iPad Air 2 and an Apogee ONE audio interface with built-in microphone. Both produced excellent results. I have no complaints--I'm a new believer! Oh, and I've auditioned lots of audio editor software on the iPhone, iPad, Mac and Windows platforms. I'm a long-time Logic Pro user and I have become a devoted Reaper user. I wanted an audio editor for the iPad that would do everything I needed including cut-and-paste, normalizing, effects . . . TwistedWave is truly great software. I record our church service using this app and a Sonoma wireworks guitar jack 2. It sounds great. Good app for podcasting. I had been using Twisted Wave for almost a year for my voice over work. It was easy to use and I got all my projects in on time. Then, this weekend as I'm trying to edit an audiobook that is due in a couple of days, it crashed. It's still showing that the recording is there, but it won't open. It's also not letting me email any previous recordings I've done. I've tried to contact Twisted Wave support and still have not received a response. If anyone knows of a way to help me retrieve my work or if you know of any other reliable voice recording apps that I can try PLEASE let me know! Let me start by saying that at the time of this writing, I got TwistedWave Audio Editor for free, which I was not expecting at all. Normally, apps priced anywhere around $10 or above never go free. I don't know if this was just a quick little promotion or what, but it couldn't have come at a better time for me. I have been wanting this app for months, and now, I finally have it! I was excited about this app, for as long as I was, because firstly, it's the only audio editor I found on iOS that doesn't want you to buy a bunch of silly in app purchases, just to make it work well enough for you to get anything out of it. TwistedWave Audio Editor is a complete app, that you only pay one fee for, with no additional in app purchases. I like that model better than the Inn app purchasing system, so I was really thrilled when I discovered that. Secondly, I heard that TwistedWave was much easier to use than other, more popular audio editors for iOS. And thirdly, I heard that it worked well with Apple's screen reader, VoiceOver. Upon downloading TwistedWave tonight, I was totally overjoyed to find that all the great things I've heard about it were very true. 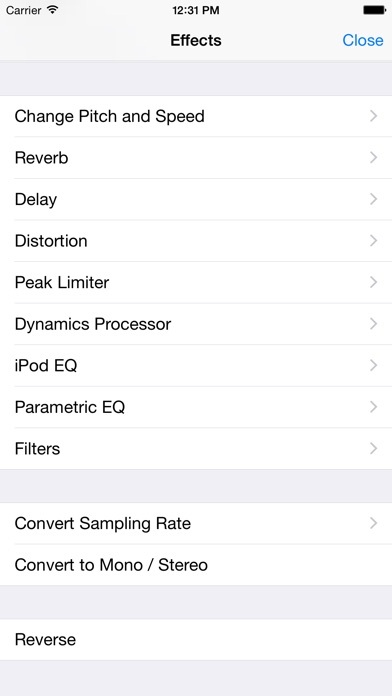 This is exactly what I've been looking for in an audio editor for iOS. With just a little more time to mature, and a little more practice using it, on my part, TwistedWave could easily be just as useful to me on my iPhone as Amadeus Pro is on my Mac. That's saying a lot, because I seriously love Amadeus pro, and TwistedWave is the only iOS audio editor that comes anywhere near Amadeus Pro's functionality. The only glaring omission, at this point, is multi track recording, but I'm certain that could be easily solved in the future update. TwistedWave can already paste the contents of one audio file on top of another, so that the two play simultaneously and can be exported as one track, and that's close enough, right now. Besides, other iOS audio editors I've tried don't even have that paste over feature, and I love that feature. That something I use in Amadeus pro all the time, and I am so happy to find it here in TwistedWave. Selecting parts of an audio file is very easy to, and cut, copy, and paste work exactly as expected. I've worked on a few large audio files, and none of them have made TwistedWave crash, so it seems to be pretty stable as well. However, despite how much I'm starting to really enjoy using this app, there is one tiny little problem. I cannot scrub through an audio file with VoiceOver turned on. I can hear the position of the cursor spoken to me by VoiceOver, but I cannot use the screen readers gestures to move the cursor. I just have to let the audio play through until I find a position where I want to make my edits. That's a little inconvenient. This app would definitely be five stars, if only that little annoyance were fixed. But, I'm sure that's no problem. I'll just have to wait for an update, but until then, I will keep practicing with it, and keep using it, until I get the hang of every control in this app. It is so worth keeping for me, and I would still think so, even if I would've paid regular price for it. I used this app during a live radio broadcast (I also use Voice Record). Both are awesome apps. If I could change one thing it would be the option of having access to a multi-track feature. App allows music imports, however from what I can tell it ends up on the same track with my voice - not helpful. I paid for the upgrade - give me one more track at least. Awesome sound quality! Love the extra features that Voice Record doesn't offer. This is a great companion for editing sound bites for any application or tightening up samples for a DAW. 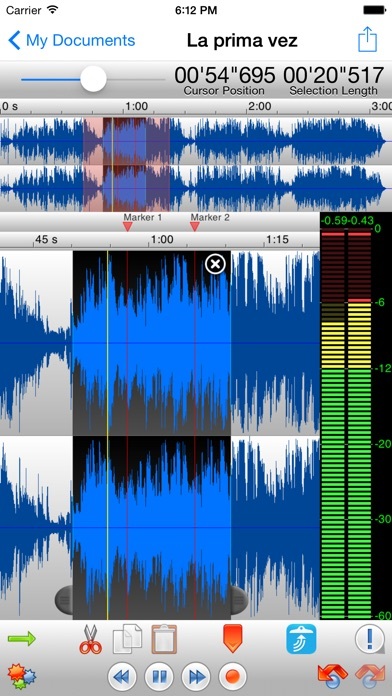 Great intuitive design ... if you have ever edited any audio you'll already know how to use this app. It used to be great how I could import my music into TwisedWave Audio Editor using the iPod Library selection in the Import menu. But, for the last two updates or so, on my iPhone 6 Plus running iOS 11.4, well this function isn't working for me anymore. I click the iPod Library button and it looks like it is going to load that menu for a second. But, then it just goes back to the home menu in the app. I don't understand what is going on? I've owned this brilliant audio editor application for years and being able to use the iPod Library import feature was always very important and helpful to me. Would you please fix that and put out an update so that this function will work again on my iPhone 6 Plus running iOS 11.4 please? It would mean so much to me if you would please look into this issue and problem I'm experiencing with the app and fix it please. Thank you if you will, I would be very grateful and thankful. And also, thanks so much for this one of a kind audio editor application. There is nothing on the App Store that even comes close to the top tier, professional quality of TwisedWave in my opinion. Thanks again if you'll fix this problem I'm having. And thanks to the developer for all of the time, hard work and dedication you've put into this amazing app over the years. I'm so grateful for that support to this app and us users, thank you. Similar to Audacity, this app is perfect for recording my old vinyl records and audio cassettes to my iPad & iPhone. The interface is easy to understand and use. The app is very much worth the price. A quality product! A suggestion I recommend is to clear some history because my really over edited audio that is 3 minutes long takes over a GB. Overall, this app is amazing. It doesn't deserve a average rating of 3.5 stars, it deserves at least 4.5 stars or more. Keep up the great work!